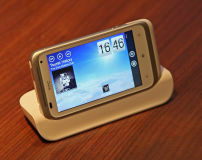 The HTC Radar has a unibody construction too, but a proper one this time. On the downside, this means that the 1520mAh battery is non-removable. The HTC Radar offers a choice of Active White and Metal Grey paint jobs. Anyway, the Radar stands at 120.5mm x 61.5mm x 10.9mm and weighs 137g. Not bad but nothing spectacular either. Its screen measures 3.8" in diagonal and is of the S-LCD variety. The resolution is once again WVGA. 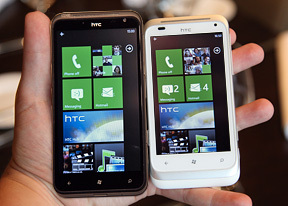 The HTC Radar is a mid-range device, offering 1GHz CPU and 512MB RAM to run the Windows Phone 7 Mango. Again, that was enough in the past but with multitasking it might be another story. The camera is a 5MP unit and has LED flash. It can record 720p video as well. You get 8GB of internal memory to store your videos and there's no way to expand it either (typical WP7). The Radar has an optional dock as well:. 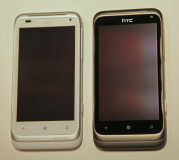 The HTC Titan was expected - all manufacturers are pushing for bigger screens. Jumping straight to 4.7" is a bold move by HTC. Keeping it slim was great too - large phones are sensitive to kind of thing and feel like bricks if they are too thick. We're also glad to see the faster CPU but we're not too sure about the RAM. Or the 720p video recording. And last time HTC tried a unibody like that, things didn’t work out too well for the antenna. Still, anyone who got an HD7 are probably thinking "it's time to upgrade" right about now. As for the HTC Radar, we're not so sure - who would give up their 7 Trophy to get what is very much the same phone? If you're itching to get the new Mango sweetness, then maybe, but unibody aside we hardly see any worthwhile hardware improvements. Of course, our time with both the Titan and the Radar was much too short to pass any final judgments. We'll save that for the review, when we can look at each detail closer. 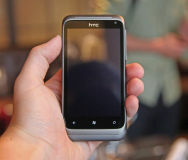 The HTC Titan and HTC Radar are both expected to start shipping at the end of September and become widely available in October. HTC was mum on pricing and carrier info, however. We're curious to see how the market will react to the first Windows Phone 7 Mango powered phones - WP7's market share has been dwindling and Mango is what's supposed to turn that around.